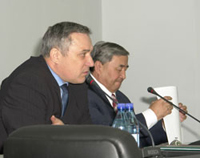 Economic justification on construction of the Kyzyl-Minusinsk (Kuragino) railway required in respect with the development of the Elegest coal field and other parts of the mineral complex has been approved May, 17 at the Expert Council, Russian Ministry of Trasport headed by Mikhail Levitin, minister. It is a large step forward in making an ambitious business plan realizable, in spite of the fact that the project itself has never been approved of or even discussed on the official local level. Tuvan deputies get news in this regards from the federal news agencies. Fires are currently raging in Tuva over the total area of 5,000 hectares. 10 fires have been registered in the republic, the two largest ones covering 980 hectars and 960 hectars correspondingly are on in the Kaa-Khem district, the smaller ones - in Chedi-Khol and Ulug-Khem districts. This became possible after the Tuva Republic Government made a decision on the transfer of the wooden lands of the third group of Saryg-Sepsk forest area of the Kaa-Khemsky forestry of the total area of 3.33 hectares to the category of unwooden lands for the development of the alluvial gold deposit by 'Vostok' Ltd..
Today a khoomei-competition dedicated to the 85th anniversary of famous Tuvan khoomeizhi Maxim Dakpai, takes place in the Iyme village, Sut-Khol district. The village is a birthplace of many renowned singers. Out of 16 people's khoomeizhi of Tuva three come from Iyme. Young Bady-Dorzhu Ondar and Choduraa Tumat were also born in Iyme. A new program for the Third 'Kyzyl-Moscow' Music Festival will be announced on the 13th of June at the Moscow Cultural centre 'Dom'. As Georgi Beletski, festival director, who prefers to be called by Tuvan name Arat, reported to 'Tuva-Online', during the presentation of the 3d 'Kyzyl-Moscow', the dates and the place of the traditionally held in Autumn festival will be specified. 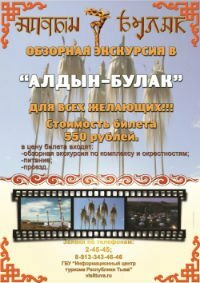 A recent series of seminars to study media legislation, organized by the Tuva-Online news agency across the Tuva Republic, was nearly disrupted because of the Erzin District Administration head Aldyn-Kys Kombu's reluctance to authorize an event sponsored by an "opposition" organization, reports Glasnost Foundation Digest. According to Dina Oyun, Tuva-Online editor-in-chief, the managers of a district school, club and other seminar-friendly sites, who had initially volunteered to host the event, were told by the district head to shut their doors to the attendees. Vera Bailak, 82, and Kyrgys Chamzyryn, 86, are the only Tuvan war veterans who lived up out of the legendary Tuvan Cavalry Squadron numbering 206. Tuvan People's Republic, since 1921 an independant state, took the Hitler's agression against the Soviet Union as its own disaster. Tuva-Online seeks funding for its current activities. Any financial help - from $1 to $ 100 - is welcome. Tuva-Online is a not-for-profit organization run by a group of Tuvan journalists. It was set up 5 years ago with the only aim to make information about Tuva and Tuvans open and accessible to anyone. Anatoli Kvashnin, a long-awaited in Tuva official, respresenting Vladimir Putin in the Siberian region, finished his 3-day-visit to the republic in the centre of Asia. On the last day of his trip he was to meet representatives of the Tuvan intelligentsia which were thouroughly sifted for this meeting by the Tuvan Government. Those, who were not let in, managed to pass over a note to Putin's Ambassador. Kvashnin got furious and ordered to open the doors.